I have just joined ILRI’s Changing Demand and Institutions Team as an Agricultural Economist based in Nairobi, Kenya. I am delighted to be back in the development business and to be able to blog about it! 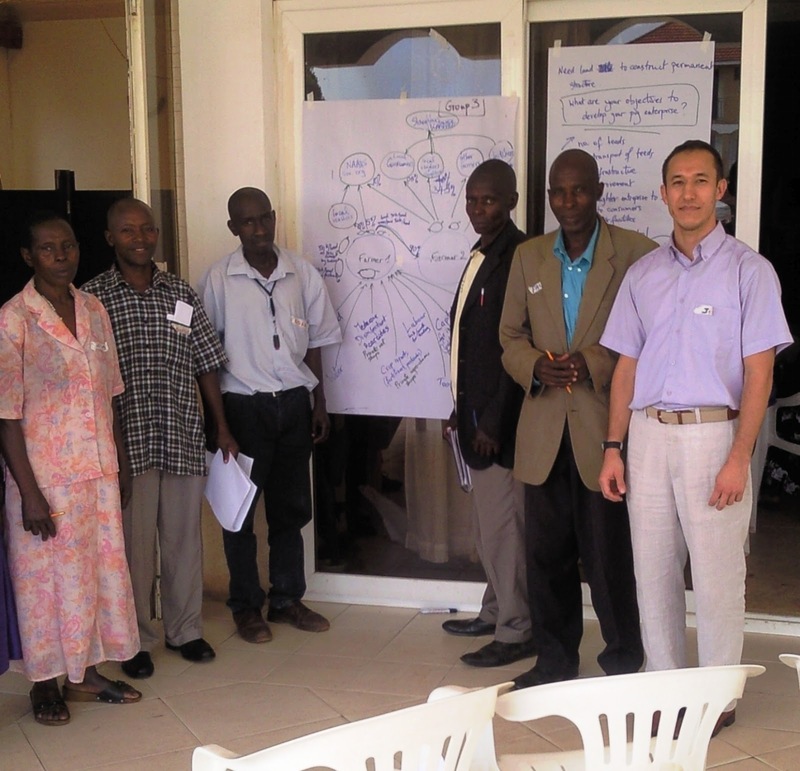 Only two days into my new position I joined a team of colleagues already working in rural Uganda on the Livestock Data Innovation Project (LDIP). The objective of this project is to strengthen the capabilities of national statistical and veterinary services in collecting and analysing livestock data. The project is funded by the Bill and Melinda Gates Foundation and implemented by ILRI, the World Bank and FAO, in collaboration with the African Union Interafrican Bureau of Animal Resources. ILRI’s contribution to this project is to develop the methods and tools that will enable local development partners, veterinary services and statistical departments to understand better the structure of livestock production and marketing systems in their country. The objective of this trip to Uganda was to continue testing the group interview workshop method to collect quantitative data and the constraints analysis workshop method to collect more qualitative data on local dairy and pig production and marketing systems. The ILRI team comprised animal breeding experts Julie Ojango and Ben Lukuyu, the animal health expert Henry Kiara, and my economist colleagues Derek Baker and Nadhem Mtimet. 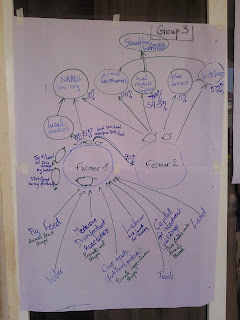 The workshops with producers went very well thanks to the logistical support of ILRI’s Diana Oduor and facilitation and translation help from our local consultants and project partners. Despite the important human resources mobilized for this exercise and some more work needed to strengthen the sampling method, Derek believes this method is a cost-effective way to collect reasonably robust statistical data from farmers. The concept is to gather around 35 producers dealing with the product we are interested in from one area into one large room so that they may complete the interview questionnaire individually, though with the help of the research team and their producer friends and local veterinarians. We had asked the local veterinary counterparts to sample the producers for us in order to get a wide selection ranging from smallholders to medium-sized agribusinesses. The questionnaire filling exercise took around four hours including a tea break and we are confident the data collected is robust as the research team was assisting all the time. 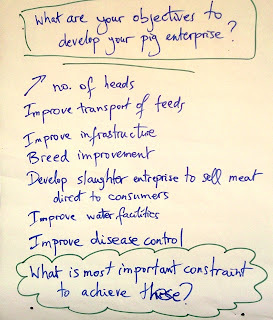 On Friday afternoon I facilitated a value chain constraints analysis workshop with a group of six pig producers from Wakiso District. 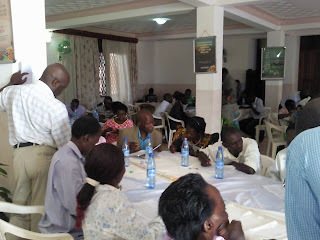 The objective of the workshop was to identify the marketing constraints the producers were facing to develop their pig production enterprises. 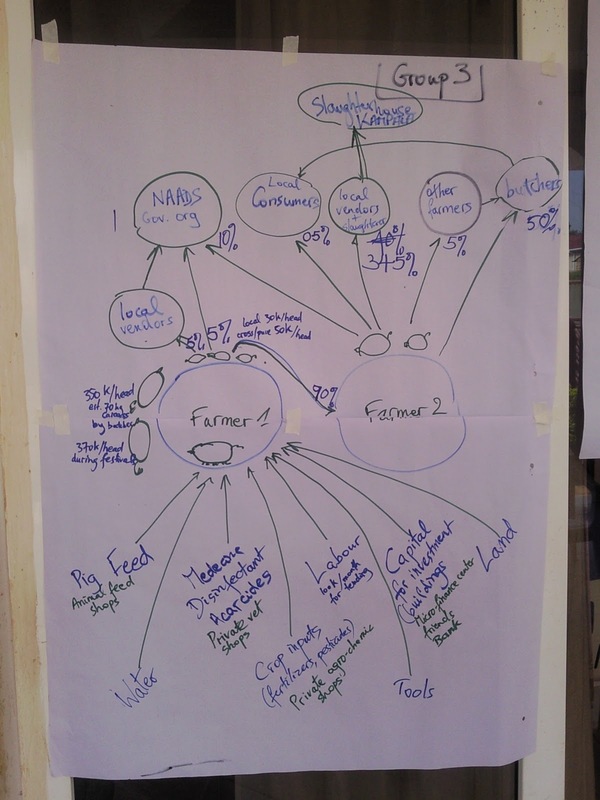 We first started by mapping out the pig value chain in the district. 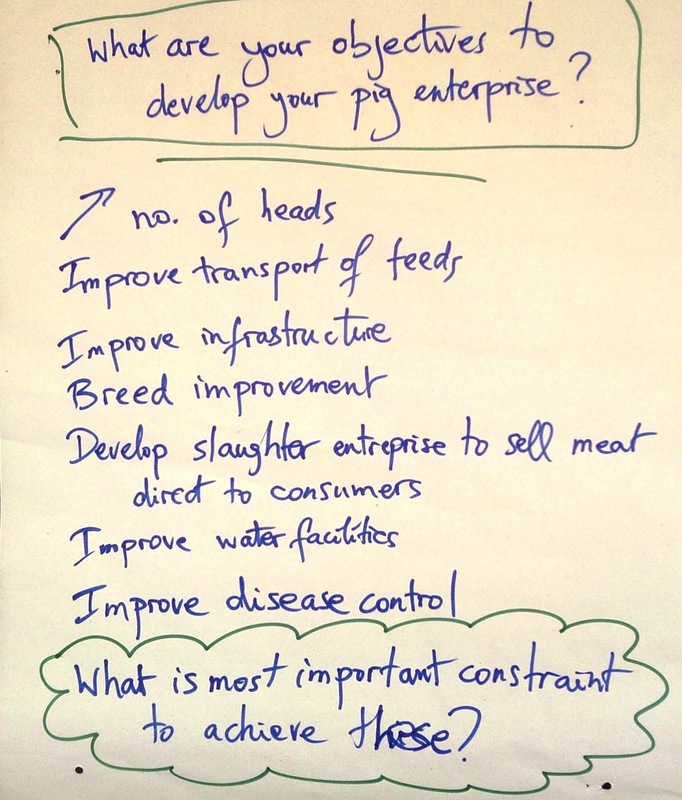 I then asked the producers to state their objectives in terms of developing their pig enterprise. Finally, I invited the farmers to list the one most important constraint they were facing to reach their development objective. 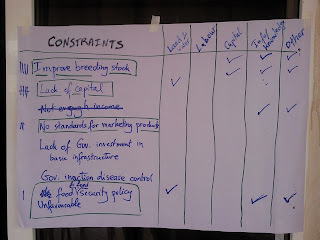 I narrowed down the list to four items by asking the farmers to identify the most important and the second most important constraints. 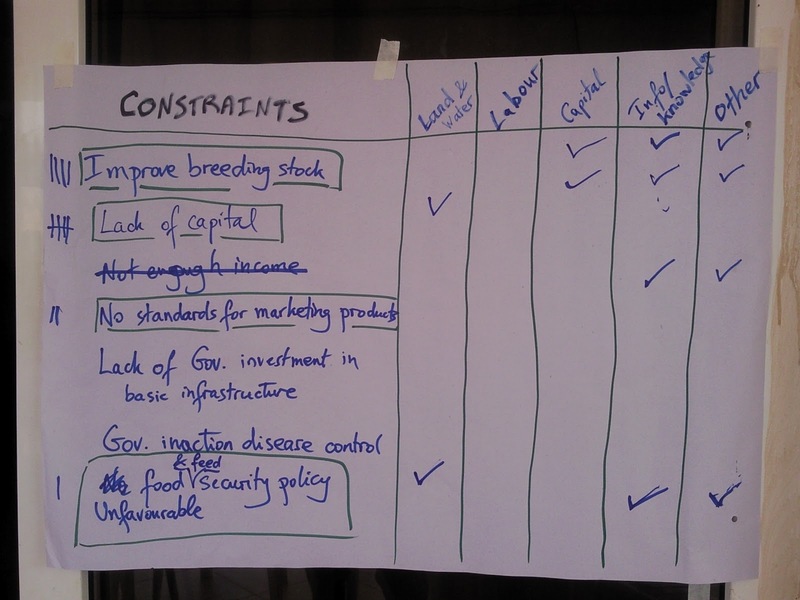 We then linked these to ILRI’s hypotheses of five major constraints faced by livestock producers: land and water, labour, capital, knowledge and information, and other (government policies, institutions, infrastructure etc.). Further analysis of all the data collected through these producer workshops will enable us to identify the constraints faced by livestock producers in Uganda and Tanzania, and to link these with their general characteristics and choices of production systems.